A national level alliance for the opposition before the 2019 polls appears unlikely and if there is to be one, it has to be only post-poll. Several opposition leaders have been echoing this sentiment of late. So, as of now there are no plans to forge a pre-poll alliance by these major parties. The argument appears to be that the Janata Party came into existence after the 1977 polls. The United Front came into existence in 1996 after the Lok Sabha election. The NDA was formed after the election in 1998. The UPA was formed after the 2004 election. The same thing will happen in 2019 after the election. Is that a good strategy? The opposition knows that to win against the BJP they have to be united. Direct two-way fights are crucial in the Lok Sabha poll. Of the 543 parliamentary seats 106 across nine states (Madhya Pradesh, Chhattisgarh, Gujarat, Rajasthan, Uttarakhand, Goa, Himachal Pradesh, Arunachal Pradesh and Manipur) will be BJP versus Congress fights. BJP won 100 of these 106 seats in 2014. But the stakes are even bigger in the remaining 437 seats, which witnessed multipolar contests. The basic calculation for the opposition is in how many of the 437 seats can they field common candidates against the BJP. This is where the need for opposition unity is crucial. For this the opposition needs alliances because the 2014 poll showed that the BJP won with just 31 per cent of the votes while the opposition claimed 69 per cent. 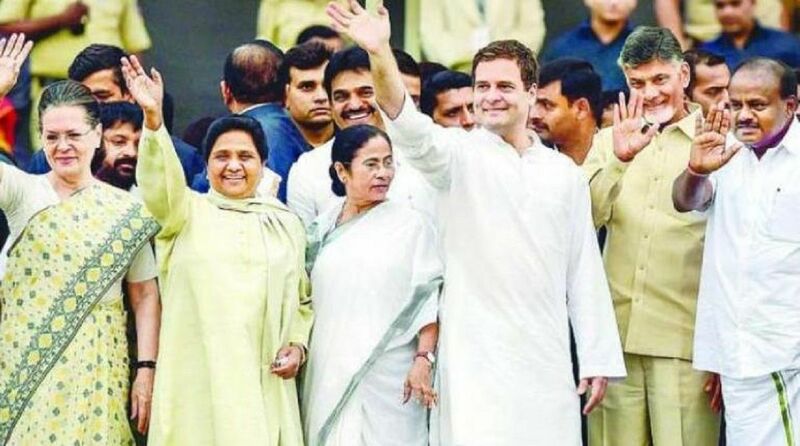 One of the reasons for the win was the division of opposition votes even though regional satraps like Mamata Banerjee, Naveen Patnaik and Jayalalitha held sway over their states. With the non-BJP vote divided, the BJP won in most seats. Some of these regional parties could provide incremental votes as they have a surprisingly strong reach beyond their home states. If there is no opposition prime ministerial candidate, the BJP will make fun of the opposition for lack of leadership. When the DMK leader Stalin recently suggested that Rahul Gandhi should be the opposition prime ministerial candidate, other parties like the NCP and Trinamool Congress objected saying that it would be decided in the post-poll scenario. Congress President Rahul Gandhi also has made it clear that it will be decided after the polls and whoever gets the largest number could bid for power. In the meanwhile, the Congress and the BJP are strategizing their poll alliances with regional parties at the state level ahead of the 2019 polls. The NDA, which came with 40 partners in 2014, is now minus 18 of them. The UPA is more or less intact and has even added allies. Of the four major NDA allies, the Telugu Desam quit in March and the Shiv Sena is threatening to go it alone. The Akali Dal is not very happy with the BJP. Upendra Kushwaha was the latest to leave the NDA. The saffron party is trying to build alliances with YSR Congress, AIADMK and other parties besides trying to keep the flock together. The Congress leaders say that there can be no national level alliance as they are going to be only state specific. Such a strategy was successful in Bihar, Gujarat and in the recently concluded Assembly polls in five states. The Congress has stitched alliances in Maharashtra, Telangana, Andhra Pradesh, Karnataka, Jharkhand, Bihar, Kerala, Tamil Nadu, Jammu and Kashmir and Gujarat. It is in the process of firming up alliances with the SP and BSP in Uttar Pradesh. The key is in UP where 80 seats are up for grabs. The BJP won 71 of these seats in 2014. It is not clear how far the opposition will succeed without a pre-poll alliance. Prime Minister Modi is depending on his TINA factor as well as the disunity in the opposition. There are too many ego problems in the opposition, particularly from the regional satraps. Some like Sharad Pawar and Mamata Banerjee are hesitant to work under Rahul Gandhi and the Congress being the largest national party expects the leadership to go to Gandhi. This disunity will only help the BJP as voters might be worried about the lack of leadership in the opposition and also whether the alternative would become worse with a hotch-potch government. In any case it is being predicted that the BJP will emerge the single largest party with or without majority.